I Got the Getting Ready for a Sub Blues! I don't know about you but getting ready for a sub to take the reins in my classroom is a big ol' bummer! ...and frankly being a sub has it's challenges too! It isn't a cake walk for the sub either! I used to be a sub. Walking into someone else's classroom is like strolling into an airport in a foreign country. The substitute teacher thinks, " Quick read the lessons, find the materials, figure out where to pick up the students, Can I go to the bathroom? Where is the bathroom? I will try to answer student and parent questions but clearly I have my own questions!! " 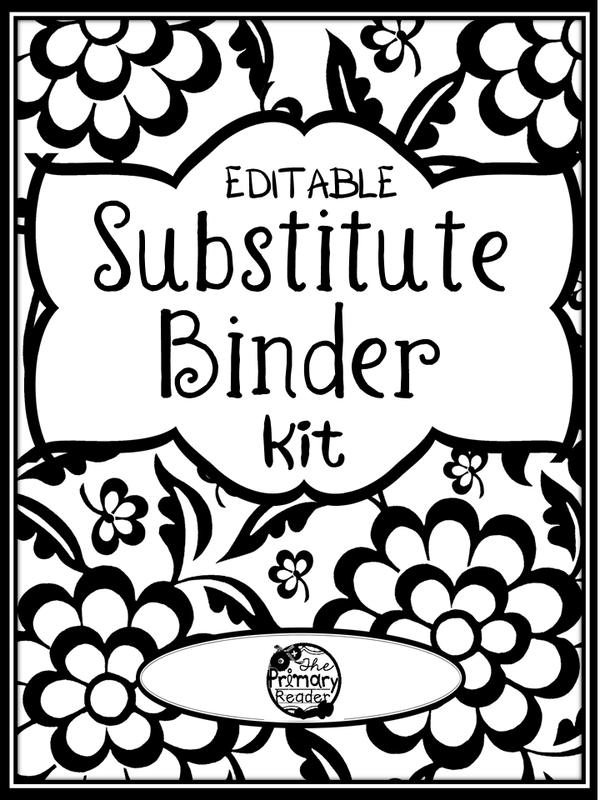 This year I made a binder for my sub......It is a survival guide and it is chocked full of things that the sub needs for the day. There are classlists, parent phone numbers, procedures, location of materials, staff phone numbers, emergency lesson plans, etc. etc. etc in a one binder. All of this is editable so I can change the information from year to the next. I also get bored... I love all things pretty and cute. So I made lots of different binder covers so that I switch them out each year. While I was at it I decided that maybe I would like an editable lesson planner for myself. I would be very organized then!!! I also started making LIFESAVERS! NO PREP LESSON PLANS FOR THE SUBSTITUTE OR FOR YOU IF YOU HAVE AN EMERGENCY" All you need to do is to download the file, send it to your sub and your students will have worthwhile of engaging activities with minimal materials to scout out and prepare. You can find this product at Teachers Pay Teachers, Teacher's Notebook and my newest e-store at Teachwise. Click on the cover and you will be led to the Teacher's Notebook site where the product is on sale this week. Margins on forms have been adjusted so that you can three hole punch the forms. You may also wish to place the forms in plastic sleeves for additional durability. ****Principal and administrators may purchase this poduct to distribute among staff to ensure accountability and uniformity in information provided to subs.